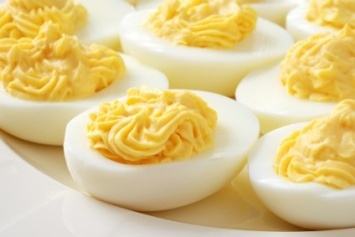 The traditional deviled egg recipe never really goes out of style. We may think it does, but put a plate full of these treats on the table and they are gone in a flash, each and every time. Place the eggs in a saucepan with enough cold water to cover them. Bring the water to a boil and boil for 9 minutes. Drain the hot water from the pot. Run cold water over eggs for 1 minute to stop the cooking process and cool the eggs. Slice eggs in half. Scoop out yolks and place in a small bowl. Mix mayonnaise, finely chopped celery and pickle, 1/2 teaspoon mustard, salt and pepper in with the egg yolks. If it is at all dry, add a tiny bit of the pickle juice to thin it out. Carefully spoon the yolk and mayonnaise mixture into the hollows in the egg whites. Sprinkle the tops with a touch of paprika for added color. Serve. Makes 12 deviled egg halves. Use exactly the same ingredients as above. Instead of slicing the hard cooked eggs, chop the whole boiled egg finely with a fork. Add the remaining ingredients to the chopped egg and mix well. Serve on bread. The simplest egg salad recipe? Just chop the egg, add Miracle Whip (instead of the mayonnaise) to achieve the texture you want, then add a touch of pepper. Voila! An easy tasty recipe for egg salad sandwiches. The Miracle Whip has a bit of tang and you won’t really need lots of extra seasonings. Try adding just a pinch of dry mustard instead of the already made mustard. It gives a subtle hint of taste. Omit the mustard altogether. Add a bit of sweet pickle juice to the egg/ mayonnaise mixture for added sweetness. All of these variations can be used to vary the basic deviled egg recipe. And of course they all make great egg salad sandwiches. I have given you a few variations on a deviled egg recipe, so you can try a few options. You can also see how to easily use the same ingredients and make a delicious egg salad sandwich filling. So easy – and so good. If you are an egg lover and want more like this devilled egg recipe, you will find all of our egg recipes here. Easy to make, simply add jalapenos instead of the relish.